Thanks to Tumaini Afrika member, Sheena Smith, and so many Tumaini Afrika supporters, we have been able to purchase 310 goats for girls in Kenya over the past few years! At $50.00 each, 100% of your funds go towards the cost of the goats. Goats as livestock help improve lives. Goats can be milked, they breed easily and take up little space. Selling or trading the goat milk helps financially. Eventually the goats may become a nutritious meal. Purchasing a goat for a Kenyan girl is a great gift for the Canadian who has everything. They are a gift that keeps on giving, a gift of "hope!" Compass School is a school for orphans and refugees aged 5 to 17, grades 1 through 8, located just outside of Nairobi, Kenya. Compass relies on donations and income generating projects to function. To date, Tumaini Afrika has provided funds to help rebuild a chicken coop, purchase chickens, and expand the vegetable garden. We also provide funding for a daily lunch program since this is often the only meal the children are provided with each day. The purchase of a generator and wiring enabling lights in the classrooms during the dark rainy season has been greatly appreciated. Funds have gained the employment of a sewing teacher allowing for the teaching of a marketable skill for the students, as well as enabling the creation of projects that can be sold. A visiting missionary wrote us to say that the most important thing that we have contributed has been "hope"! On a trip to the school in 2016, school supplies, soccer uniforms (donated by SASA), toothbrushes (donated by Dr. Michael Nanne's practice) and toothpaste were received by the students. As well, an art lesson was taught and education regarding sexual health was given to older girls. Days for Girls kits were distributed to the girls and some teachers. Update February 2018: At one point it looked like the Kenyan Government official in the area was going to take back the land that Compass is on to build a hospital as part of a political move. Since then, a new government official is in office and he is known to be "friendly to Compass." Currently, younger students are temporarily attending Compass at another site called The Creche, which we visited in 2016. We should have a better idea of what is going on in the next few months. Principal Annastacia has taken on a teaching job in another nearby school but will remain in contact with Compass School as a board member. On our 2018 trip, we handed out school supplies, tooth brushes, pillowcase dresses, soccer balls and hula hoops, painted some classrooms with the students, and handed out more Days for Girls kits. We had a great time singing songs and dancing with the students and staff. We also met with the MCA - Member of County Assembly, Henry Kagiri, and advocated for Compass School including having the playground property returned and requesting some funding from the government. CGC is a program run in rural communities in Africa created by a Kenyan woman. It provides a four-day leadership and life skills training program aimed at young girls aged 10-20 years, with the intention of addressing issues that perpetuate women's vulnerabilities including: low school enrolment, female genital mutilation, early marriage and teenage pregnancy and the exodus to urban slums. It encourages the girls to pursue their education and make a plan for a better future. Parents/guardians, teachers, boys and community members are also involved in the educational sessions. At a cost of 10 American dollars per student, Tumaini Afrika has managed to support over 1,000 students thus far in the program. On our 2018 trip we travelled to Western Kenya and sat in on the student run Caucus meetings and heard what the girls had to say. The mission statement for the grassroots organization Days for Girls is to create a more dignified, free and educated world through access to lasting feminine hygiene solutions. The absence of feminine hygiene supplies causes girls worldwide to miss up to 2 months of education and opportunity every year. In partnership with the SSM Sewing Bees, members of Tumaini Afrika distributed 166 sanitary kits with reusable feminine hygiene products when they visited Kenya in March, 2016, and 205 kits in March 2018. Members of TA have also been involved in the creation of these kits. The girls were thrilled to get underwear as well as reusable sanitary products so that they can attend school every day. Saultite and Tumaini Afrika supporter, Karen Swystun, took 100 Days For Girls kits for young women in Mathare when she travelled to Kenya in 2017. Namuncha is a Maasai Village in rural Kenya. Currently attempting to grow their schools so more children in the area may gain an advanced education, officials requested support in building a fence (complete with barbed wire) to surround the school thereby keeping the children safe from predatory African wildlife, as well as keeping local cattle who eat the produce grown in the gardens that are a part of the Agriculture programs, out. Funds for this fence and some needed textbooks were donated by J.J. and Donna Hilsinger. A water tank was also needed and was provided by a grant from the Retired Teachers of Ontario. In March 2016, five members of the group travelled to Kenya to assist with the fence construction and to provide some education. Thirty four families benefitted from a much appreciated gift of a goat, with funds sent by donors in Sault Ste Marie. Tumaini Africa member, Sylvie Mackey, hosted a young man, Sam, from this village in her home for three months this past year through the Canada World Youth Program. On the 2018 trip, members made a day trip to Namuncha and handed out more goats to the women and children there. In March 2016, the five travellers were introduced to staff and children at the Mathare Community Centre. This centre provides schooling and food for many children in the Mathare Slum in Nairobi where 700,000 people live in extreme poverty. While there, the five members of Tumaini Afrika had a group discussion with the teachers regarding issues at the school. Although we have some similar concerns in our Canadian schools, they were nothing to the extent of these. After this terribly emotional and eye opening visit, we decided to offer assistance from our fund raising ventures. We have sent funds to build three new kitchens, complete with stove pipes and ventilation, from which the children will be fed. While on our 2018 trip, funds were given for mattresses and classes were taught by team members, including sexual health, relationships and geography. 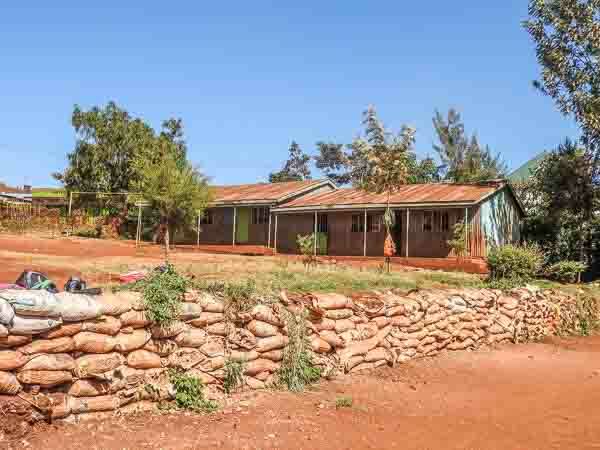 We have raised funds to repair the girl's and boy's dormitories in the MCO orphanage and school in Kariobangi, as well as to build two new classrooms so more children can attend. In Kenya, there are few services that deal with children with special needs. These children either stay at home locked away due to public shame or they go to school without extra help. Heshima offers a free service to special needs kids who live in a small slum in Nairobi. On our 2016 visit to Heshima we delivered a donated children's wheelchair. In March 2018 we visited Heshima again and this time brought school supplies and musical insturments and spent the day teaching and playing with the kids. Check out the Heshima link on our Interesting Links page. Mary Warindi, a single mother of three from the Bul Bul Informal Settlement outside of Nairobi, designs and creates beautiful pillowcases and wall hangings. We are honoured to help Mary sell these works of art. Please contact us if you are interested in purchasing one to help support Mary and her family. Geometric designs are $45.00 and all funds go directly to Mary. Because of Tumaini Afrika's affiliation with Africans, we were asked by the Sault Community Career Centre Newcomer to the Sault Program if we would offer practical support to a new family from the Congo. Members assisted with transportation, grocery shopping, English as a second language and teaching about Canada and Sault Ste Marie. As the Congolese family has now relocated to Toronto, some members of Tumaini Afrika continue to assist with other newcomer families with much needed housewares and furniture as well as teaching ESL, and helping them navigate the system. To date, members of Tumaini Afrika have made over 25 presentations on our African trips and ventures, to service clubs, community groups and local schools. Please contact us at tumainiafrikassm@gmail.com if you are interested in a presentation. Students must pay to attend school in Kenya. They are required to have a school uniform as well as textbooks and school supplies. If the family has no money the child cannot attend school. Although Tumaini Afrika deals only with helping large groups of children, many of its members and some of their friends sponsor needy students. If you and/or some of your friends are interested in sponsoring a child to attend school, please contact us for further information.